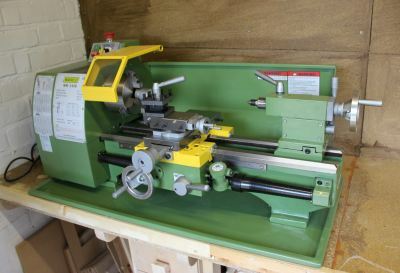 It has taken me months of looking and comparing lathes to get to the point where I ordered this lathe. 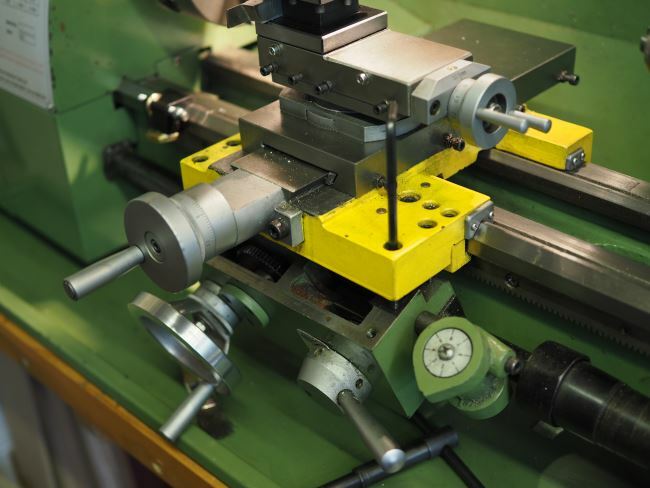 I looked at the Quantum lathes and on paper they look great, but when I went and spoke to the UK importer and had a look at a lathe they were no different to any of the other Chinese imports. The supposed “German” quality checking and engineering really was not in evidence. The warning I got from the Quantum importer was that the variable speed units had a habit of failing. 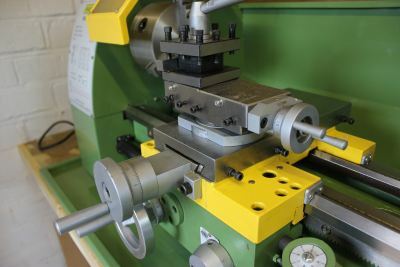 This comment made me wary of the other variable speed lathes which may be unfair (would love to know your experience). So the Warco WM240B was ordered and delivered 3 weeks later (delivery included) and the delivery person was happy to deliver and move the lathe to a point that I could then unpack and install. With the chuck and steadies removed it was just about possible to lift the lathe between two of us. Although I do think we will both know we lifted it for the next couple of days!!. The tool clamping bolts have a square head and the lathe comes with a special T-handle box spanner. So it is very easy to change tools. I made some packing pieces out of different thicknesses of aluminium as even the 12mm tools need packing to get to centre height. 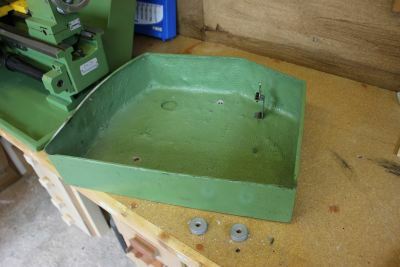 Having used aluminium tool packing for some time I would not recommend it as it has a tendency to pick up any pieces of metal left behind and they get embedded into the aluminium. The result is they do not always sit flat. A better way is to use brass shims or an old set of feeler gauges. One of the first things that struck me when first using this lathe was how stiff the toolpost is allowing you to take very large cuts. This is of course helped by the 12mm tools that just do not budge. I bought a left-hand and a right-hand TCT cutting tool from Glanze. These work great as the 12mm tool is so stiff and so very precise cuts can be made. The cover over the belts and gears is made from fibreglass and is fixed in place by two knurled thumbwheels. This is one of the more tacky pieces of the lathe and is just not to the same quality as the rest of the construction. Also the safety switch consists of a steel pawl fixed to the cover and this locates into the other side of the switch that is fixed to the headstock. The alignment of this is tricky to get right. The gears are steel and from the limited running to date are very quiet. 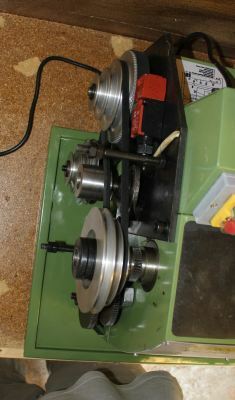 One thing that is lacking with this lathe is the lowest speed of 100rpm. A toothed belt drive is used to get the reduction to a 3 stage v-belt pulley and the toothed drive is very quiet. Will have to see if somebody out there has designed a further reduction drive – my other thought was to fit a 3 phase motor and then an inverter speed control – thoughts? At the top of the photo on the right you can see the toothed belt reduction pulley. The motor drives a toothed belt reduction drive for the three lowest speeds in the range with a V-belt pulley with 3 steps that then drives the spindle. 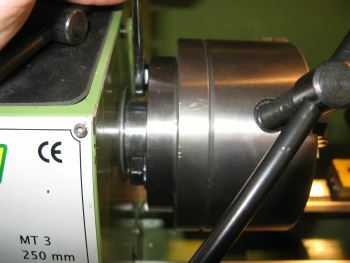 The motor also drives a V pulley with three steps that is used for the three highest spindle speeds. Changing speed is quite a simple task of slackening the tensioning roller, moving the belt and then re-tightening the tensioner pulley. You don′t need to go mad and tighten the bet too far. I made up a piece of 1/4″ steel packing as it is very useful sometimes to use 1/4″ square HSS tools as they can give you a bit more access, especially when machining a recess. 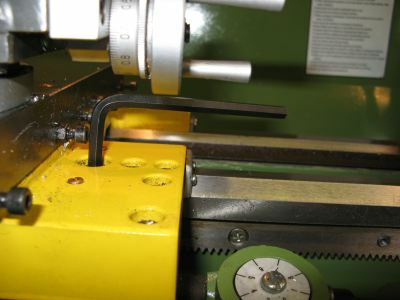 The 1/4″ steel tools tend to be much shorter and so not possible to catch them under the wider spaced bolts, but the first two bolts give an adequate clamping force. 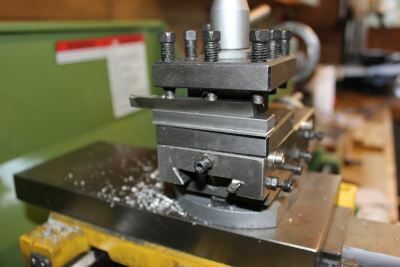 I have been machining a cylinder for a new engine and so using a parting tool to cut the grooves for the cooling fins. After lots of broken tools and some very poorly formed fins I realised that the saddle was moving under the load. It took me some hunting in the manual to find how you lock the saddle to the bed. As you can see there is a large caphead that you tighten to achieve this. I tried moving the bed with this tightened you can still move the bed slightly – you will need to have a play and get used to how tight it needs to be to stop the bed moving. Also, clearance on the cross-slide adjustment bolts is not great with an allen key left in this bolt – also be careful to release before you apply the auto feed. Ordering process and delivery was first class, all the parts were there and in very good condition. 4 months old: a cracking piece of equipment that I would highly recommend. 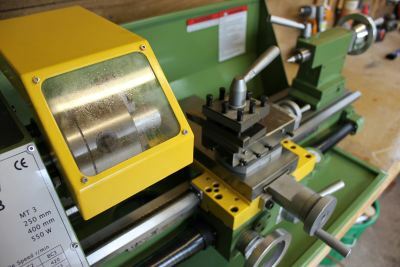 I would like a milling machine of the same quality if possible – with the belt drive…..
3 years and 8 months old: this is the workhorse for all of the metal turning that I do. I have machined wheel hubs for a rally car, cylinder barrell for an air-cooled IC engine with some difficult deep fins and have machined some finer detailed parts at 1000rpm. I have been around and tightened up saddles and taken some backlash out of handles, as expected really. 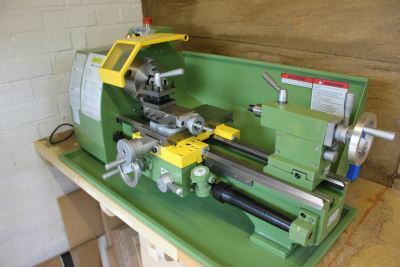 I have thought about fitting a 3 phase motor and inverter, but quite frankly the range of speeds is good and as of yet with the work I have done with this lathe have not found it lacking. 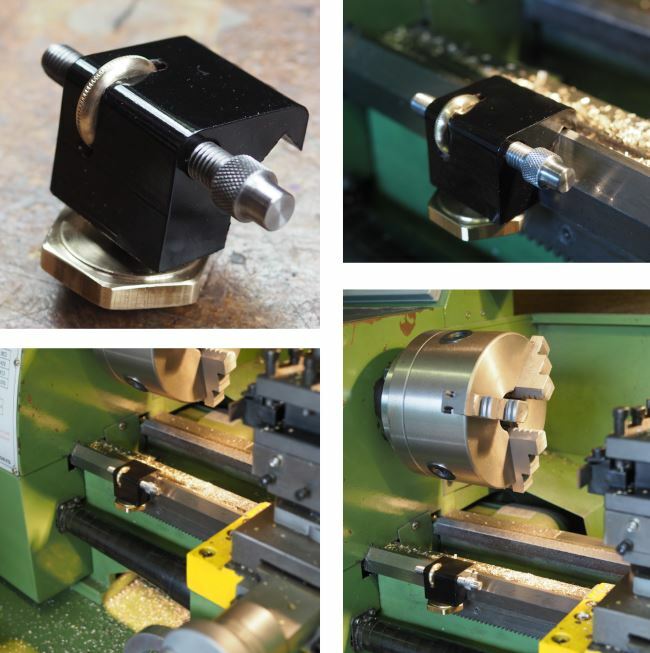 Warco ER25 Collet Chuck – I′m impressed. The price was not too high, the machining of the backplate took a couple of hours to complete, taking time to check and re-check. 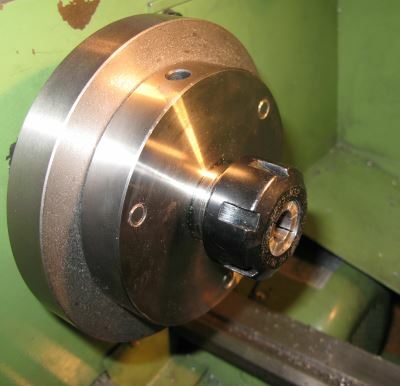 I have now used the chuck to machine some parts and it works really well. I now have quite a lot of ER25 collet chucks and so a healthy number of collets. 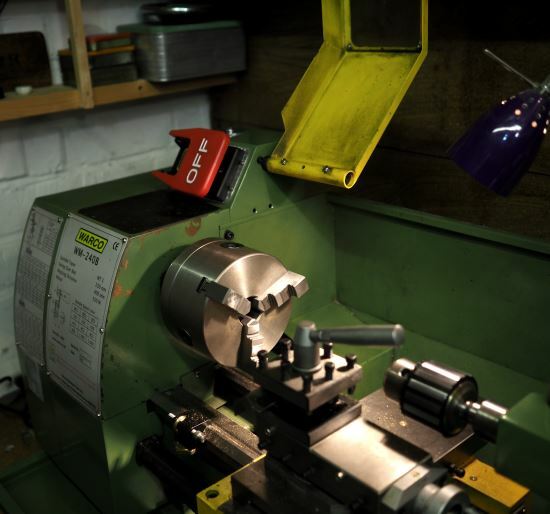 Changing the Chuck on a Warco Lathe – this is not a difficult process, just needs some care and take your time to clean the surfaces before reassembling. 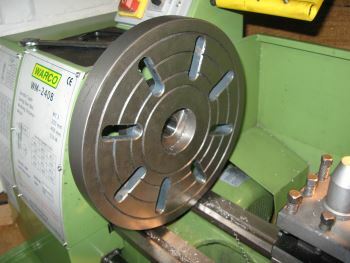 Faceplate for the Warco WM240B – the faceplate that comes with this lathe is huge, this is great as it means you can machine some very large parts. However, there is a fundamental design flaw with the lathe that is not so great. The saddle adjustment on the Warco is quite simple and rather crude, but don’t be afraid to drop the saddle and check that everything is adjusted as required. I never thought I would want a saddle stop, but I’m getting quite into making this for the lathe. It has a cast iron body and neatly drops over the V on the bed. New NVR Switch – There was no bang or sparks or smoke, I switched the Warco WM240B lathe off and it just would not restart. I did all of the usual things of checking that there was power at the main plug and that the fuse was intact and all was fine. One thing I didn’t try was to switch it on, holding the green button in and then rotating the chuck to see if it would then rotate – as someone later pointed out the capacitors on the motors have a tendency to fail. 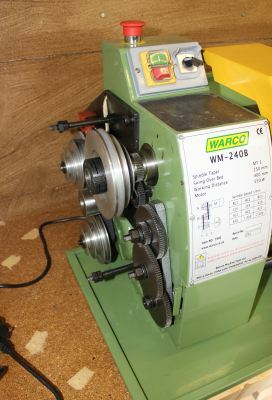 Nigel, I am a machinist for work and have been using the Warco WM250, a very similar machine, for roughly the last year (bought from new). Although it doesn’t see very heavy use it is used every day, a lot of repeat jobs, stand offs, extractable dowel pins and simple stuff. I find it is a great machine mechanically, but the electronic speed control, which isn’t terrible, is its downfall. The speed controller has failed once, when having a dig in situation, but luckily Warco replaced the unit (excellent service!) They are usually quite easily repairable by replacing the two thyristors on the PCB though! I also find it struggles to tap a hole bigger than M6 with the motor, the speed needs to be kept quite high.